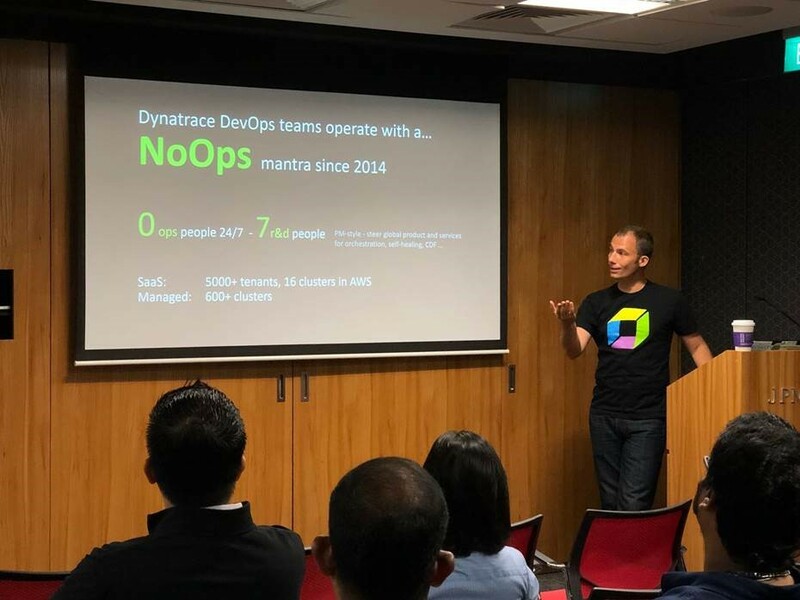 The Dynatrace Perform 2018 APAC Series kicked-off in Sydney on July 3rd, followed by stops in Melbourne, Singapore, and Kuala Lumpur. 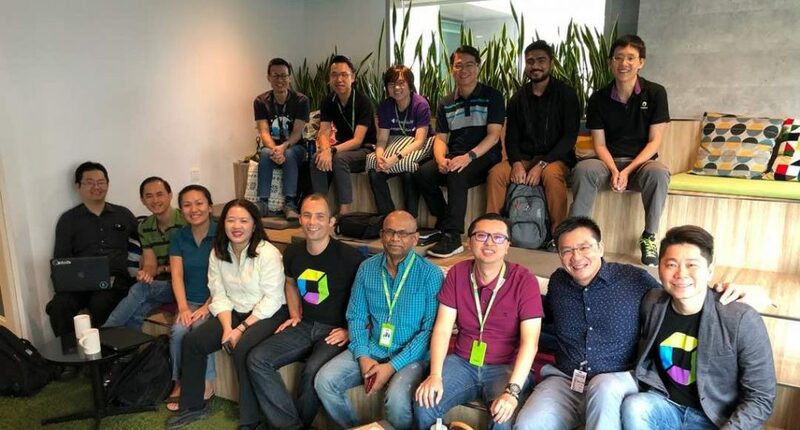 In each city, I was invited to present our own DevOps to NoOps Transformation Story, give my views on Adopting Enterprise Cloud Technologies and deliver a Hands-on Training (HOT) session on Auto-Remediation: Building an Unbreakable Delivery Pipeline. 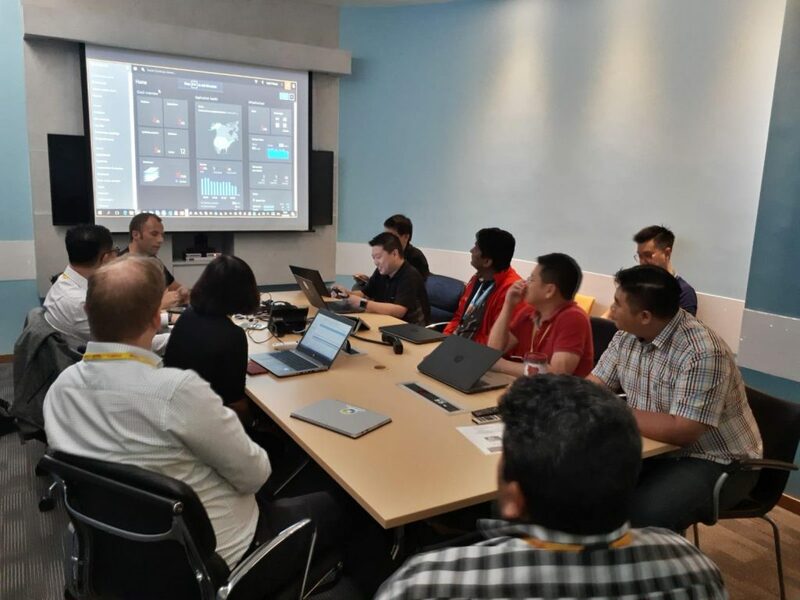 Our HOTDAY in Singapore: Building the Unbreakable Delivery Pipeline in 2 hours! I was also invited to meet different Operations, Development, Business, Platform and DevOps teams of several of our customers and partners. I wanted to take the opportunity and say THANK YOU for all the great feedback I have received, the warm welcomes, the invitations to come back soon and the commitment to allow us help with strategic enterprise cloud migration projects. Is the rest of the world better than us? 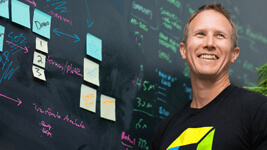 Atlassian should be no stranger to anyone in the industry. 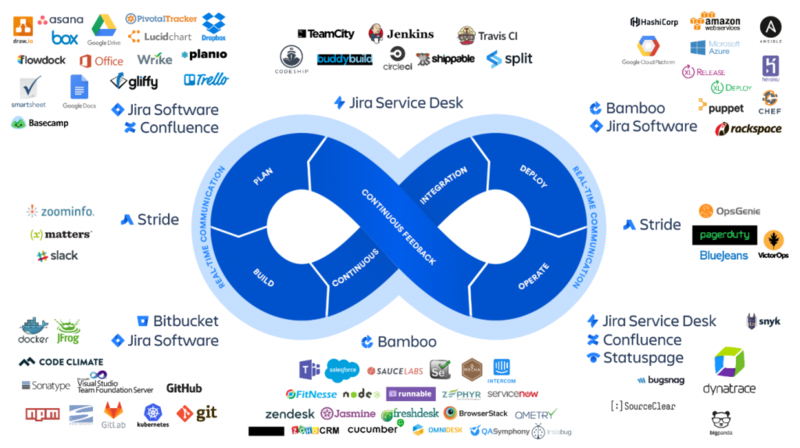 Their collaboration & DevOps tools such as JIRA, Confluence, Bitbucket, Bamboo or Stride, are helping many companies around the world to improve their development processes. Roger Barnes, DevOps & ITSM Product Manager at Atlassian, invited me to their office in Sydney to chat with their Bitbucket Pipeline & Bitbucket Server teams on how our joint customers can better implement our Unbreakable Delivery Pipeline. Roger also joined me on stage in Sydney & Melbourne and presented the Atlassian DevOps Transformation story. There were many key takeaways from his talk but if there is one thing I would highlight, then it is the Atlassian Team Playbook They are meant to monitor team health and strengthen team skills and is free to use by everyone! 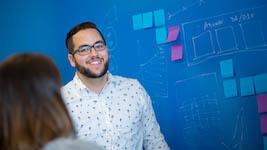 Besides having Atlassian as a great partner to work with, we also joined forces with one of their partners – Addteq – who just published their first Dynatrace for JIRA Plugin on the Atlassian Marketplace. This plugin connects your Ops to Dev by linking JIRA tickets with Dynatrace monitored entities such as problems or other Smartscape entities. 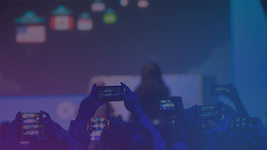 A common theme – and this was also true with ANZ Bank – is modernizing their enterprise cloud stack by adopting RedHat’s OpenShift Container Platform. OpenShift gives them the flexibility to run their containers on any infrastructure provider (on premise, public, private cloud …). 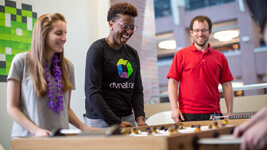 I got to chat with two members of the platform team and we went through the automation capabilities of the Dynatrace OneAgent which allows them to implement Monitoring as a Service in their OpenShift environment. We discussed the concepts of Shift-Right (push context information from your deployment tools to Dynatrace) and Shift-Left (pull monitoring data back into your delivery pipeline to make better automated decisions on every code commit). Dynatrace automatically monitors your complete OpenShift environment, every container, every service and logs. 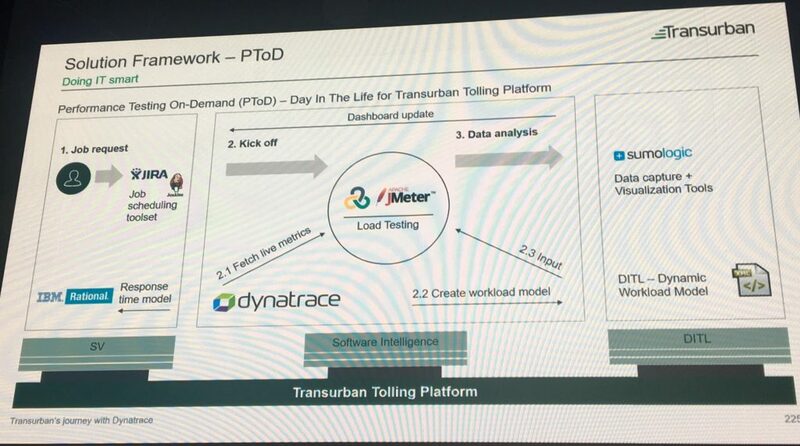 Michael Legg, Lead of Test and Release Manager at Transurban, gave a great talk in Sydney and Melbourne where he talked about how Transurban is working on “Simulating a Day in The Life” in their automated performance environment. Transurban must process millions of transactions every day that come in from toll booths, tunnels, bridges, … across Australia and North America. 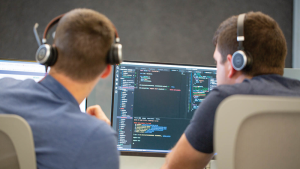 To ensure that every new code drop can withstand the real load pattern they see during a 24h day, they automated the process of simulating the exact same load from yesterday’s production in today’s continuous performance environment. 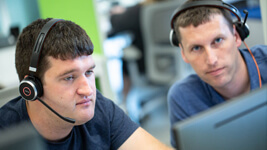 I was invited to meet their partner Planit, who helped them implement this approach and we followed up with a further discussion on how they can leverage monitoring data across their end-to-end delivery process! Being in Singapore for our PERFORM event triggered their local team to invite me to deliver a shorter version of what I have done for their colleagues in the US. There was a lot of interest on how to implement the concept of “Monitoring as a Self-Service” in their existing, but also new, enterprise cloud stacks, how to leverage the REST APIs to pull data into other tools, how log analytics can be integrated with monitoring and how to leverage the Dynatrace AI for better operations. 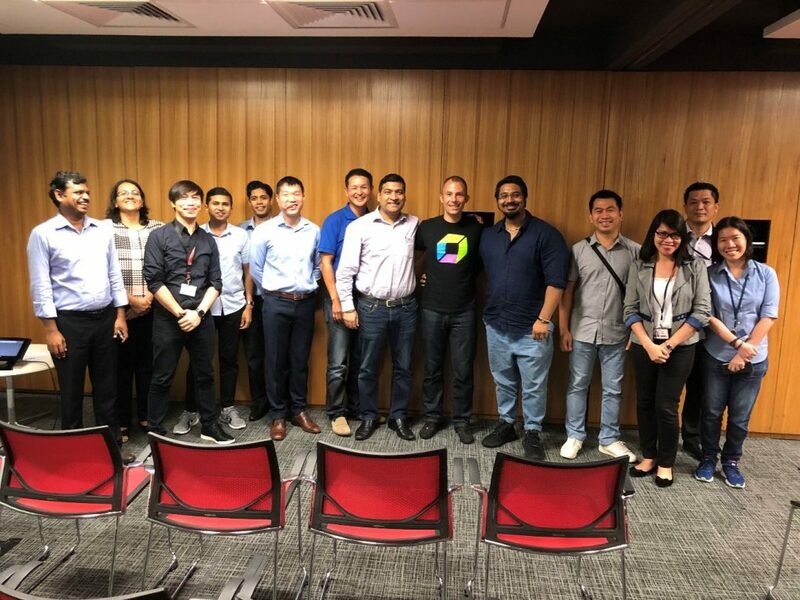 Thanks JPMC team in Singapore for hosting me to chat about the topics I am passionate about! If you think governments are boring and old-fashioned, then you should visit the GovTech office in Singapore. When I walked in, I felt like walking into an office in one of the hip Silicon Valley startups. Lots of open space, young engineers having discussions in the lounge area and a really cool slogan right on top of where I was later going to give my presentation: Be Happy, Be Awesome, help others to be HAPPY & AWESOME! Great way to welcome people at the GovTech office in Singapore! After discussing Customer Experience, we then focused on Performance as a Self Service. 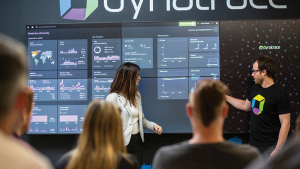 Making sure to elevate the traditional processes of getting performance feedback by leveraging the Dynatrace AI to not only get more data but actual root cause information. 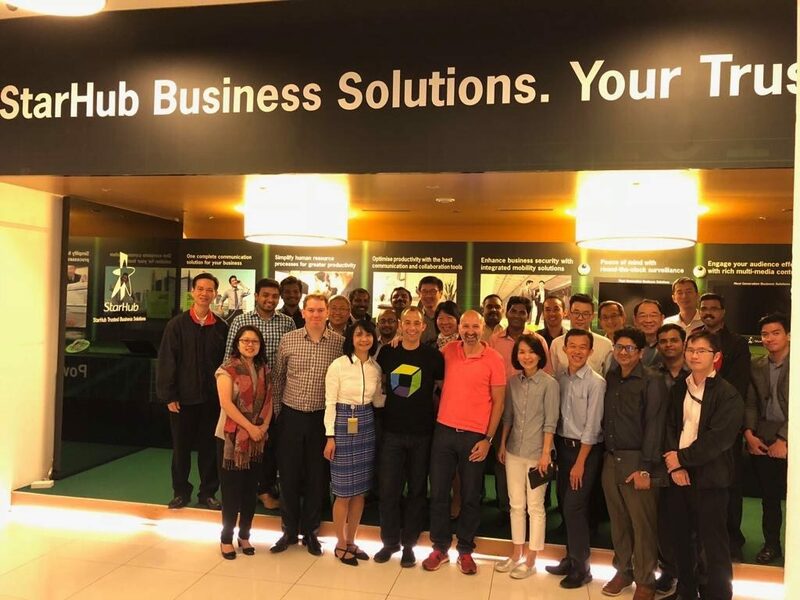 Thanks StarHub for hosting us. Hope to be back soon! Some special thanks goes to Alice who recovered my forgotten laptop charger. I left it behind, but she and my colleague Kim made sure I got it before hopping on the plane back to Europe! Maxis, a key mobile telecom providers in Malaysia, invited us over for a similar discussion. The two main groups in the audience were application delivery and operations. We discussed a lot about “Monitoring as Code” and how to enforce this concept along their CI/CD Delivery Pipeline. 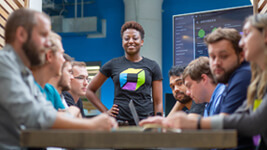 Last link was to the Dynatrace CLI, which is an easy to use Python script that implements several use cases on top of the Dynatrace REST API, e.g: Monitoring as Code which can then be called directly from Jenkins, Bamboo, Concourse or Team City. The last visit on my trip was with DHL, who have their office in the “Silicon Valley of Kuala Lumpur” (Cyberjava). DHL has been a long term Dynatrace customer and I met several fans of AppMon and PurePath. I took the opportunity to let them know that I have lived and breathed PurePath for the first 9 years at Dynatrace but that there is more than analyzing PurePaths. In this meeting it was all about OneAgent, Smartscape, AI and how it benefits both Operations to find root causes faster but also about how to better integrate Dynatrace into their load testing processes. DHL is using LoadRunner and were happy to hear that the same LoadRunner scripts they used for AppMon can be re-used for Dynatrace by following my best practices on Load Testing with Dynatrace. For those customers that use LoadRunner and have not been adapting them for AppMon we have good news as well: We are just about to release a new tool called “LoadRunner Request Tagging for Dynatrace” which does something like our LoadRunner for AppMon conversion tool. 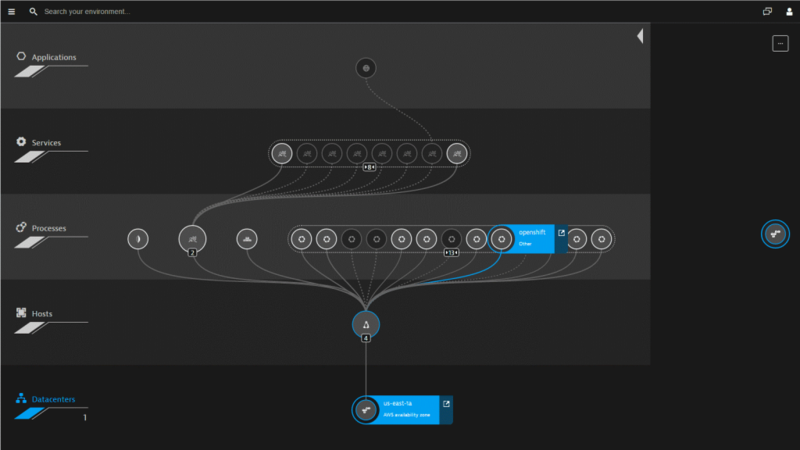 So – keep an eye out on the blog and the documentation around Load Testing Integrations with Dynatrace. Is the rest of the world better than they? After reading these stories I wonder what “the rest of world” now thinks: are you better than what I’ve seen in Australia, Singapore and Malaysia? Or maybe they are further ahead than the global curve? In the end, the most important thing is that we all share our stories, best practices and challenges so that we as a global IT community can get better in what is important: Delivering Perfect Software Experiences! If you have any questions on material you want me to share let me know – happy to send you more links to blogs, presentations, webinars or podcasts!